90-degree V-twin displacing 250 cc. Honda's recently introduced VT250 Spada lightweight motorcycle features a diecast aluminum box-section frame, which the manufacturer claims to be the world's first application of such design and construction. The company's own Italian subsidiary has been producing a smaller model, the NSR125, which also has a cast aluminum frame, however, it has open-sectioned members. Among the merits of this frame design that Honda cites are lighter weight, by three kg, and improved lateral and torsional stiffnesses, by 22 and 25% respectively, as compared with the predecessor model which had a welded steel frame. The "CASTEC" (Honda CASTing frame TEChnology) allows more freedom in design and styling by varying section sizes, thicknesses, and shapes of the main frame members. The CASTEC frame also improves productivity as it entails less welding length (now two meters in total as compared with the previous design's three meters). The frame consists of two hollow, box-section side members which are gravity diecast, with four attachments. Diecast members are welded together at the front seams via a GDC (gravity diecast) rear cross-brace. A mid-section GDC seat-support is bolted onto the side members, and contributes to the frame's rigidity. Every stress-carrying GDC frame component is presently X-ray checked for possible casting flaws; however, Honda believes that spot checks should suffice as quality data are accumulated. The frame surfaces are shot-peened. The frame is then heat-treated and finally coated. in the updated VT250 motorcycle. 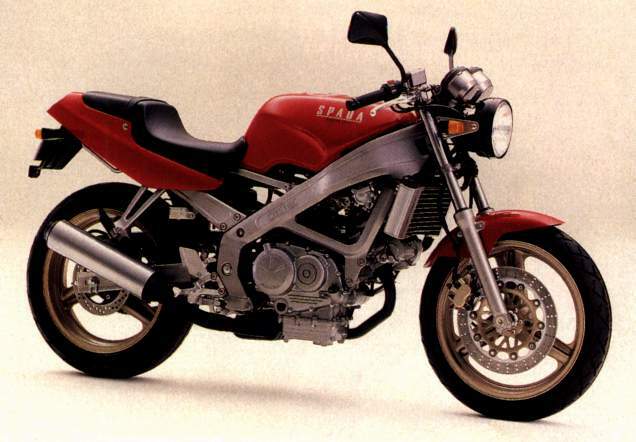 The VT250 Spada motorcycle is powered by a liquid cooled, double overhead camshaft four-valves-per-cylinder V-twin engine, displacing 249 cc, which is rated at 30 bkW JIS at 12,000 rpm. It uses a six-speed transmission and weighs 150 kg dry.